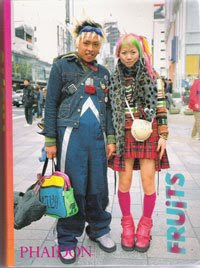 I came across this book on my girlfriend’s desk (she studies fashion at Leeds College of Art) entitled ‘Fruits’ which documents a revolution in Japanese fashion in the 1990’s centred in the Harajuku district of Tokyo. Not coming from a Fashion back ground this has to be one of the most fascinating and unusual books I have ever read. It begins with a short introduction in which the author explains how the trend started in the mid 1990’s as people became lass passive of the fashions they wore, seeing them as a way to express themselves and began to customise clothes themselves (but on a much larger and to a greater extreme than we see here in the UK). Its also explains how the trends mixed traditional Japanese items such as kimono obi belts with western influences such as tracksuits. This merging of the two fashions is referred to as Wa-mono. After this introduction the author lets their photography do the work and the book is a collection of around 200 full page photos of people wearing their own customised clothes as unless you had been in Tokyo in the 1990’s as seen the trends for yourself it would be difficult using words to describe the outfits.